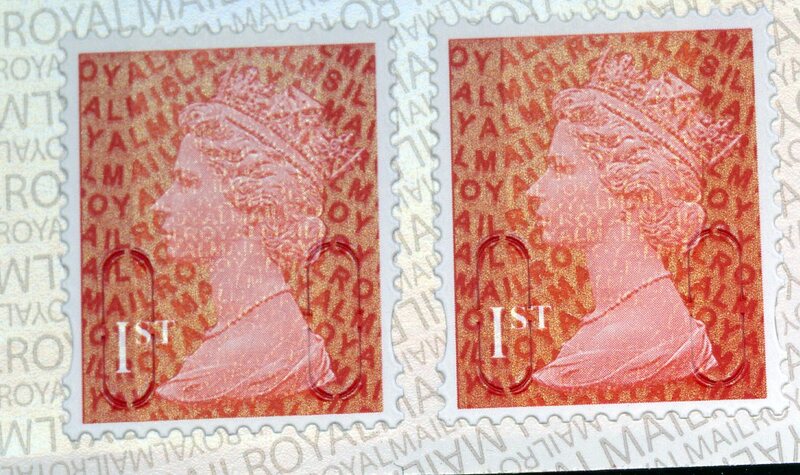 As we reported earlier the latest printing of the 1st class Wales country definitive introduced cylinder or plate C2 in all four colours for the first time. 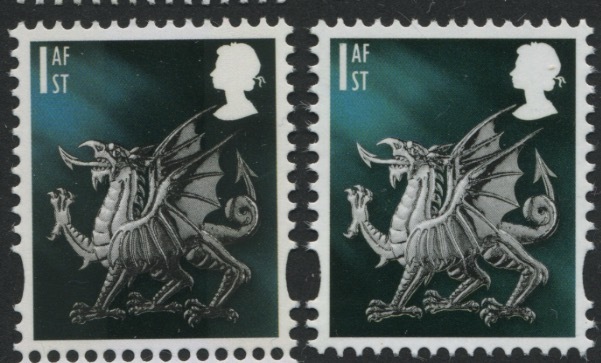 We can now confirm that by comparison with the C1 printing the dragon is a lighter shade, and so this is a collectable difference for some people. In this picture C2 is on the right. More telling, though, is the way the phosphor looks. Held horizontally to the light the phosphor C2 is much less visible than was C1. We've listed the new 17/11/16 printing on our web-shop as W122c.2, with the C1 printings as W122c. We have a few date and cylinder/plate* blocks. * I'm told the correct term for litho is a 'plate', whereas for (photo-)gravure the term 'cylinder' is normally used. However, as collectors and dealers have traditionally used the term cylinder we will continue with that. 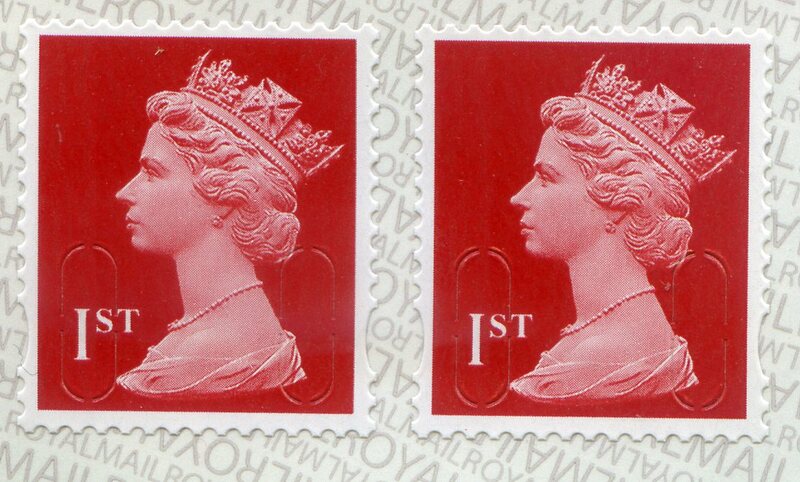 This week two new stamps have been reported found locally: the 6 x 1st booklet coded M16L MSIL on SBP2 paper, and the 1st class business sheet coded M16L MBIL also on SBP2. We hope to have these in stock next week. 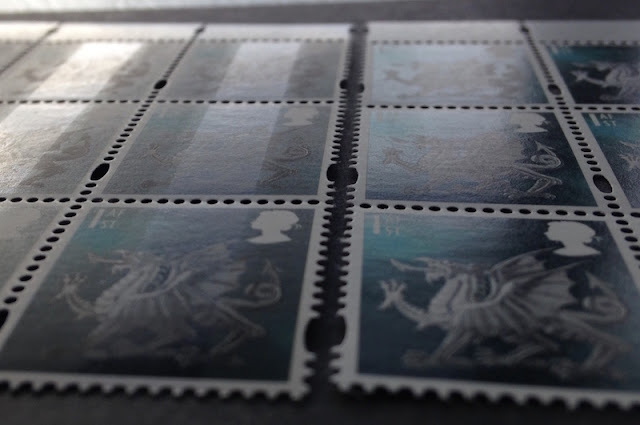 News of further new M17L counter sheet printings has reached us, and we should have these after the Easter holidays. No indication of whether there is security printed backing paper on any of these. 10p (27/01/17), 2nd Large (13/03/17), 1st (27/02/17), 1st Large (01/03/17), 1st Large Signed For (26/01/17), Special Delivery 100g (01/02/17). There are also new dates for 2nd (22/03/17), £1.17 (03/03/17). £1.40 (07/03/17), £1.57 (07/03/17), £2.27 (10/03/17), £2.55 (08/03/17). There are some quite recent dates there, so supplies must be running low at Post Office supplies and these could appear in post offices quite soon. So would the 1st be the first time the new colour has been seen in a counter sheet? Were the 1st signed for previously in the old shade of red and therefore now likely to be a shade change? Not got the stock yet, John - it will be interesting to see. I don't think they will change the RMSF, it's the branding colour for the RMSF product. Have you the date (on cellophane wrapper) of the 6 x 1st book Year 16 with SBP2 and also date for the 1st Business sheet year 16 with SBP2? I'll add them as soon as I know Doug. I have seen the 6x1st class M16L with SBP2 on the following dates:- 04/01/17 (in a Post Office); 05/01/17 & 13/01/17 (in Tesco). The Business sheets M16L with SBP2 that I have seen are dated 13/12/16. Thank you Brian, useful to have that on the Checklist.